Need advice on this product? 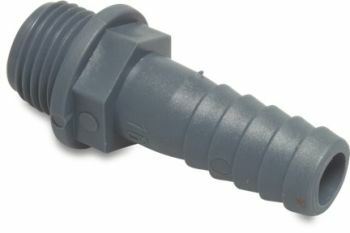 3/4 inch BSP male thread x 3/4 inch (19mm) hosetail, plastic. Couldn’t have a more helpful salesman. Jack listened to what I needed and resolved my problem. He didn’t just try to sell me the most expensive pump. I am very happy with my purchase. Excellent service from Water Garden. Haven't actually used the filters yet but this is the second set of new filters we have had and I'm sure they will be just as good as the first set. Very pleased, product & service could not be better. Excellent product so far.If stands the test of time then very good value for money. Use our helpful information section to assit you on buy and maintaning your products. By signing up you give consent for us to send you emails on our products, offers and services.